"This is Winnie the Pooh at 10 months old. She is a Westeke female hybrid. I have read several books on West Highland White Terriers (i.e. From Head to Tail) and one book on Schipperkes. I have also spoken with several Westie breeders in this region and feel that I am well-informed about the Westie breed characteristics and defects. "My Westeke is a well-balanced blend of both breeds. She doesn't appear to have any of the defects that arise for the Westies or the Schipperke purebreds." "Winnie is white with a bit of tan coloring on her back and ears. Her skin is black. She has a fox-like face and curled tail of the Schipperke. She has small, black eyes and a black nose with loads of expression. Curious and courageous—loves to chase anything that moves. Beautiful thick, luxurious coat which sheds lightly. Clip short in a Westie cut for hot weather. She has a healthy coat, nails, bones and joints. The Westeke is not a purebred dog. 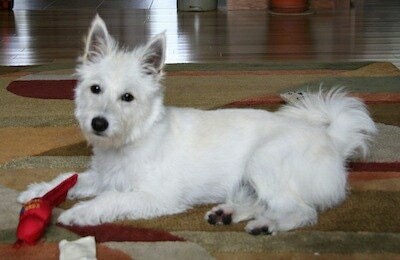 It is a cross between the West Highland White Terrier and the Schipperke. The best way to determine the temperament of a mixed breed is to look up all breeds in the cross and know you can get any combination of any of the characteristics found in either breed. Not all of these designer hybrid dogs being bred are 50% purebred to 50% purebred. It is very common for breeders to breed multi-generation crosses. “Winnie is reserved with strangers and strange dogs; she is outgoing and playful with the neighbor's Golden Lab, who is her BFF. She plays well with children once she gets acquainted with them. She is quick to learn; a must for puppy classes, which were very effective for socializing. "Winnie is a natural with a soccer ball, Frisbee, balls and stuffed toys, and swims in our "kiddee" pool—even diving under to retrieve toys. She can be willful at times; takes a firm but gentle hand to correct. Winnie is happy to play by herself and does well at home when left home for the day. She is quite verbal—barks, growls and has a Schipperke howl. She gets along quite well with our two Siamese cats." Winnie has a happy, upbeat expression. A real companion dog; will entertain you for hours. She has plenty of energy, exuberant but takes a nap with you—settles down and mellows out." "This is my Westeke puppy Winnie the Pooh. She is 13 weeks old in this picture. She has the large, triangular ears and howls like the Schipperke. She was all white at 9 weeks of age, but is developing a black undercoat. Winnie has a smaller, more fox-like face than the Westie. Big, beautiful, dark eyes and a black, perked nose. She is compact, but very agile and can run for long stretches. We walk her on a leash when in puppy classes or walking on the road. When at home, we take her outside on a 15'-reel leash, which she does well with. She likes a good run outside but always comes to us when we call her name. Winnie is a rodent hunter—she stalks birds, chipmunks and just about anything small that moves. She is boisterous and has a healthy ego. "Winnie is a hybrid—from a purebred West Highland Terrier female and a purebred Schipperke sire. She is a perfect balance of both breeds. I always owned purebred terriers until I bought Winnie. Now I am convinced that a hybrid is a much healthier, well-balanced dog. My little girl has the best traits of both her parents' breeds. She is in excellent health, is not hyperactive(she settles down quickly) and I love her look! "Winnie loves to dig in the yard. She is a great little watchdog and is territorial, but she also is well socialized with other dogs and people. However, she is a bit reserved when first introduced to strangers—dogs and people. She adapted well to our two Siamese cats. Winnie is intelligent and quick to learn—we took her to beginner puppy classes and she easily picked up all of the lessons. 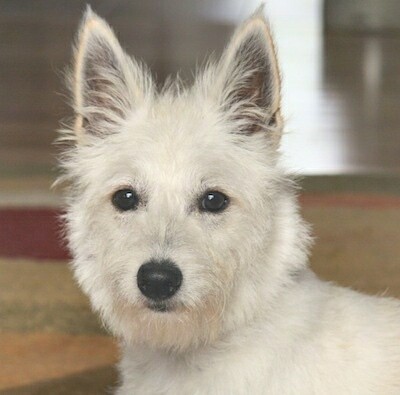 She is a typical terrier—high energy and loves to play with us. She is a bit resistant to housebreak; she sometimes waits for us by the door and other times she squats in the middle of running through the house with my slippers. Winnie is an excellent passenger when we travel in our car with her. She is usually quiet unless she has to "do her duty.""